We all know teenagers are an unstoppable plight on civilized society. This belief was no more prevalent than in the 1960s. What better way to prove the point than a movie that makes the big teenager problem even bigger? 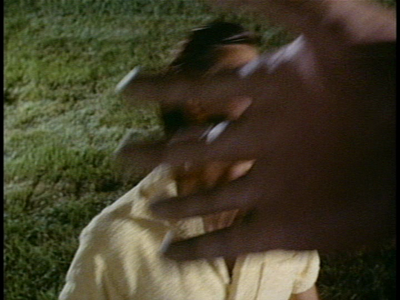 B-Movie director Bert I. Gordon interpreted the culture war literally when he directed Village of the Giants, about a group of gargantuan young hooligans who take over a small town and demand complete subservience and comparatively small portions of fried chicken. 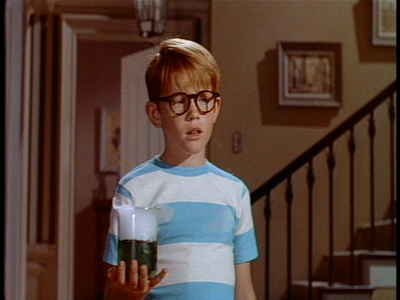 This tall tale begins with a boy genius named Genius (played by a young Ron Howard), who, during his daily experiments to create unstable multi-colored concoctions and security systems comprised of a bear trap and bottle rocket, stumbles upon a goop which causes any living thing that consumes it to develop sudden-onset gigantism. After testing it on a neighborhood cat, gaggle of unsuspecting geese, and his own dog, Genius's brother Mike (Tommy Kirk) does what any loving sibling would do and exploits his kid brother for personal gain. 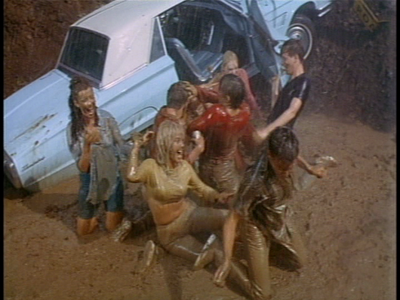 Meanwhile, a group of unruly youngsters are victim to a mudslide just outside of town. They emerge relatively unscathed, and celebrate with a 7-minute dance writhing gyration routine. Their dancing is a strange combination of Caligilan decadence, youthful exuberance, and epilepsy. Once they're done dancing like idiots, they wander into town to jive in some groovy nightclub. 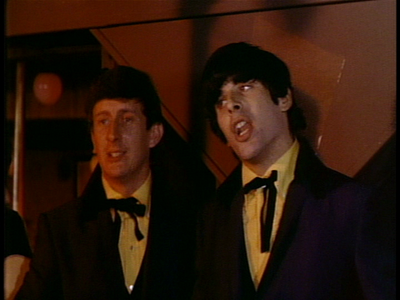 They gyrate to the tunes of The Beau Brummels, which in no way resemble The Beatles in either sound or appearance. Apparently the doorman was too hopped up on goofballs to notice the two giant geese entering the club, who groove to the music with their own avian moves. Despite being sworn to secrecy, Mike enters the club and declares to everyone that's he responsible, and it's due to a secret formula which he plans to sell and make a gagilian bucks. Aside from announcing his research paper outlining his process, his business man to market the substance, and the chemical formula itself, Mike couldn't really divulge any more information regarding his clandestine plan, and the hooligans concoct a scheme of their own to steal the formula. After a few failed attempts, the whippersnappers finally break into Genius's lab and take the formula from its hiding place in a flimsy particleboard cabinet. Their aspirations of fame and fortune go out the window when, after some youthful posturing and oneupmanship, they eat the goop themselves and become GIANT! They use their new powers to pick on people smaller than themselves. This of course consists of everyone in town, including Mike's girlfriend Nancy and the sheriff's young daughter. The townsfolk, unaided by telephones or their expropriated firearms, attempt to take a hostage of their own. Using all the best hot rods and lassos of the day, they nearly subdue the giants' mushfaced leader Fred (Beau Bridges), proving that normal folks can capture a giant, so long as he stands perfectly still for several minutes. Village of the Giants is a relic of its decade. It seems stupid and dated today, while in the 60s it was just stupid. There is some halfhearted attempt to bring social commentary into the mix when Fred talks to Nancy about how the adults are getting their comeuppance, with the oppressed becoming the oppressors. But the movie isn't long or committed enough to adequately deal with these issues. Giants clocks in at just under 80 minutes, with at least a third of the runtime devoted to lengthy dance sequences. If the movie is a cautionary tale of anything, it's the dangers of prepubescent super-science. While Giants fails at social commentary, it succeeds as a fun, worthless piece of camp. Gordon implements the most advanced camera-tilting technology for the special effects, a technique Peter Jackson must have studied with intense fervor. Most importantly, there are numerous opportunities to show off the young, attractive cast, particularly Joy Harmon, who furthered her acting chops in Cool Hand Luke by pressing her breasts up against a car window. Nancy: I never knew you liked good girls. Mike: I don't. They talk too much. Mike: So stop talking so much. Nancy: Okay. You're a rebel. I'm impressed.